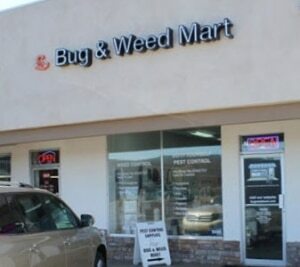 The Phoenix Bug & Weed MART store is located directly across from Uptown Plaza Shopping Center, and between State Route 51 and Interstate 17, making it easy for Phoenix residents to drop in and pick up their pre-emergent granules, scorpion black lights, and all their bug and weed supplies. Living in the city has its advantages, but having bugs is not one of them. We can help you get rid of cockroaches and roof rats, as well as keep your landscaping weed-free and looking beautiful. Phoenix and its surrounding areas are well known for its sunny weather, but that also means we don’t really have a dormant season where bugs take a break. Whether you want to keep bed bugs from invading your home, are trying to get rid of rodents, or you just spotted a cockroach in your kitchen, Bug & Weed MART carries the products you need to get rid of all kinds of pests. We can even tell you how and when to use them for the best results. Our professional grade products are EPA-regulated and are safe around your family and pets, but still strong enough to get rid of bugs and weeds. And if you need help with your weed control sprayer, any one of our store managers at our five Valley locations can take a look at it to make sure it works properly – at no charge!